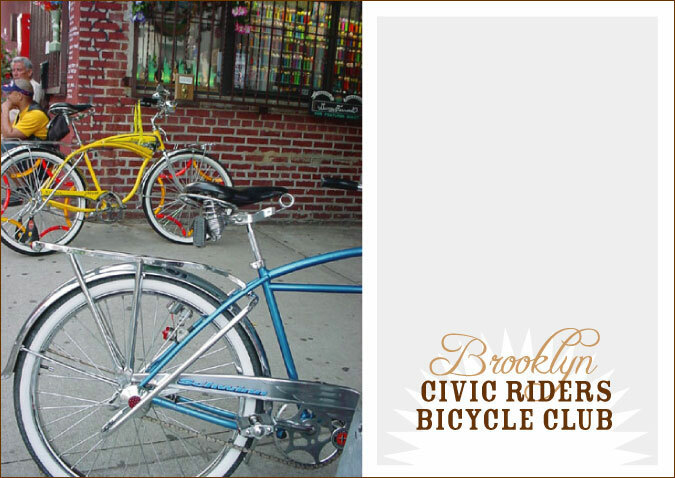 The City Reliquary and the Brooklyn Civic Riders are pleased to announce our: 2nd Annual Bicycle Fetish Day on July 1st 2006 from noon until 5 PM. Find the festival on Havemeyer between Grand & Metropolitan. CONTESTS: Best in Show, Best Vintage, Best Hand-made, Best Chopper, Best Small Wheel (includeds foldable bikes), Wheelies, BMX tricks, Track bike tricks, Heaviest Bike, Ugliest Bike, and more... BANDS, FOOD, and RAFFLE PRIZES including, IRO bike built-up by Bicycle Doc, Gift Certificates to: Catbird, Lodge, Foodswings, Loveshine, Cheeks Bakery, Maiden Brooklyn, Celebritay, and more... Brooklyn Bridge walking tours by Matt Levy of Vintage NY Tours, Merbag Messenger Bag, and more... After party on Hope street between Havemeyer & Roebling Sts. An INCREDIBLE DAY AND NIGHT for you and YOUR BIKE!!! 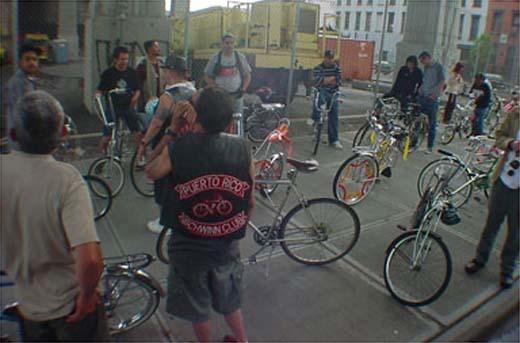 This year we will be hosting the second annual New York City Bicycle Fetish Day will be held July 1, 2006 at the new City Reliquary! This event is open to everyone who wants to come show off their ride. Local vendors will also set up booths offering bicycle repair, massages, food, contests and prizes. Check out the photos from last year to get inspired. Start shining your hub! GET WELL SOON NOAH!! WE MISS YOU!! on Tuesday, March 29th. He is currently undergoing extensive rehab under the guidance of his family in Boston. 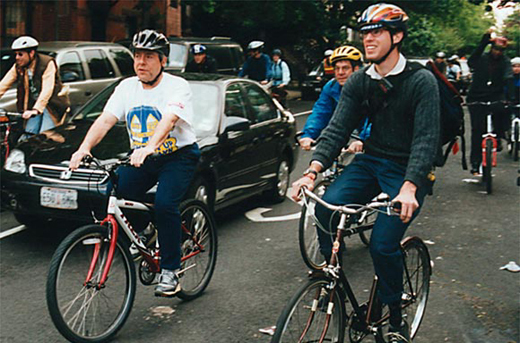 Here are some photos from the annual 2004 Brooklyn Bridge Birthday ride on May 24th. 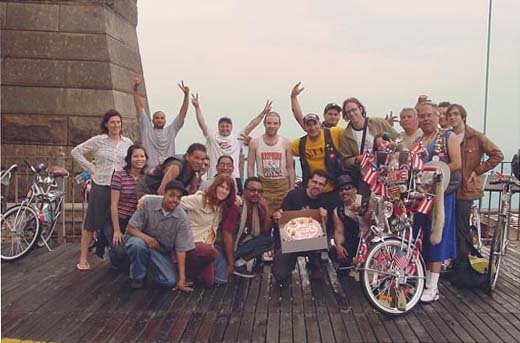 Every year, we ride to the top of the bridge and are met with birthday cake for all. Join us this year for the bridge’s 122nd birthday bash. As always, on May 24th! Here's the crew at the Brooklyn anchorage with cake for the bridge's 121st birthday. A brief pause to avoid getting rain spots on all that chrome. El Presidente from the PRSC is the first to pull out his chamois. Last year was also the 100th anniversary of the subway system which was celebrated by a ride of the entire length of the 1-9 lines. First below ground, then above riding Broadway from the Bronx to the Battery. 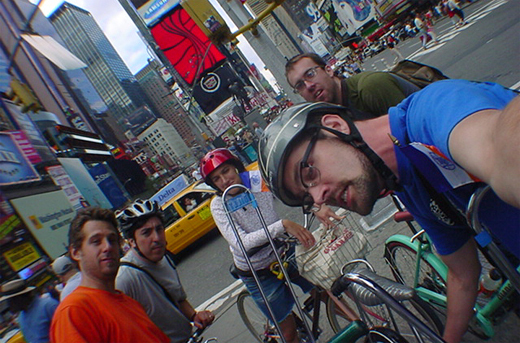 Five riders stop to represent the five boroughs at the "Crossroads of the World." Times Square was once known as Longacre Square before the famous newspaper moved its headquarters to this neighborhood from lower Manhattan. Times Square also celebrated its 100th birthday in 2004. Mayor McClellen was honored to operate the first subway train from City Hall and rename Times Square in the same year, 1904.